The FPA has recieved a large number of fake positive reviews for this company. We recommend a very high level of caution dealing with this company. This forex signal provider no more operation. Be careful. Don't pay your subscription anymore to them. I paid my subscription on march 2015 for 3 months but only received signal about 1-2weeks. After that no news from them, dozens of emails sent for refund also no reply. 2011-01-13 2Star Got rumour indicating that they may have change thier management staff( I mean the personnels that generate the signal). just rumour........ NO hard prove !! - 900 pips in 4 months, -39% of my capital with only 2% risk per trade as they recommend it. DO NOT USE THIS SERVICE !!!! They are not answering any email and are now CHEATING on the performance report !!!! SERVICE MAY HAVE CHANGED THE STAFF OR SOMETHING !!!!!! I am a customer of two weeks. I received several reports that went in the right direction, but then turned around and lost. Do you have an opinion on this? Is there a fresh posts from fxmaster.net? An update to my post i made last year. After some unsatisfactory last winter, they managed to get back on track and they recovered. I'm satisfied with results made from beginning of 2011. I will continue my subscription with them. 2010-06-26 5Star I totally love this service. It is hard to think of anything negative. The style of this service gives me more freedom in my life. I tried some services before and my mobile was flooded whole day with market order which requires i quit my work and sit whole da in front of my PC tp execute these market orders which are usally scalping signals to make few pips. What i really about fxmaster is their limit orders which are sent long time before they trigger. Some signals may open the following day. This makes me relaxed with trading and my mind is not so occupied. Update on my review last week: fxmaster's customer service responded to my email and i'm very satisfied with the explaination. Ive been told that the open position that i'm left with last week was due to the price discrepancy between different brokers. it was stopped out in their account so that's why they didn't send a signal to close it. As for new personnel thingy, they denied it. The implementation of trailing stop have nothing to do with the new personnel. Its just that they have to modify trading methods according to the market patterns. From the 20 signal i received since the 1st jan 2011, 5 signals were not triggered, 5 loses and 10 wins. I can see they are recovering and i will stay with them a bit longer to see how they are progressing. Will try to update here every month. 2011-01-21No Rating I would like to ask those who is still subscribing fxmaster signal, what is your opinion about their new system? Currently they are implementing trailing stop at 50 pips. Previously their tp and sl were at 150 and 80 respectively. However after the new system been implementec (after trailing stop triggered), average tp/sl is only at 50 pips. About the new management thingy, i heard nothing about it. However i did aware few changes: (1) they didnt respond to my email as fast as before, (2) this is first time i didnt receive any signal to close open position before weekend. Is this also their new strategy? To let the position open even in weekend? 2010-12-08 1 starToo bad. 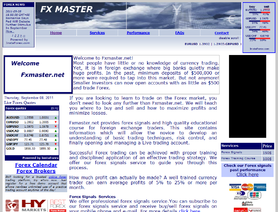 Im loyal customer of fxmaster. however their performace nowadays are too horrible that i have to share with you guys. Since 15/11/2010 till today 8/12/2010, there were 11 consecutive losses! 11 consecutive losses and counting! I know its bad to give "terrible" rating only for a month performance, but are they really doing "analysis" or rather gambling????? They better fix the situation or face risk of losing customers. 11 consecutive losses is quite a history in their record. I totally agree with Hapeace review. December performance was also very bad. I hope they had a better 2011 start since i'm giving them the last chance. I'll keep updating this comment. I think they already had over rating. Their performance absolutely down. 3 months continuously loose can't be tolerate. If we want to follow them, don't let the SL take your margin, as -80 pips is so far. Not SUITABLE for individual account. Also USD 150 per month for +/- 250 pips seems quite too expensive. I can only give 3 stars, however they still can make profit, but I decided to stop subscribe. i think this guys heared that some of their customers has big accounts and they are get paid by brokers to ruin their accounts. I`m with them since june and sincerly their trades are simply junk. They manage minus after minus. They put the limit orders in front of price action and pattern continuation setups. Even my child can put limit orders with a good risk reward but this no means that setups will be good. I have been subscribing their signals for last 6 months. I guess they are quite over rated in fpa. In view of the fact that they completed their third months of losses in a row, I give them 2 stars so as to warn traders not to take this service simply because it has high rating in fpa. Their statistics is honest (a very positive quality when compared with statistics of most EA sellars). They do not provide any justification for taking a trade (it is not necessary that they do it). Nonetheless, lately, they seem to be tossing a coin for the direction of currency pairs and throwing a dart on the chart to find the price at which to take the trade. Those who have taken the last GBP/USD buy trade would agree with me. They have big drawndawn, consecutive mounth negative. I think also this mounth will be negative.